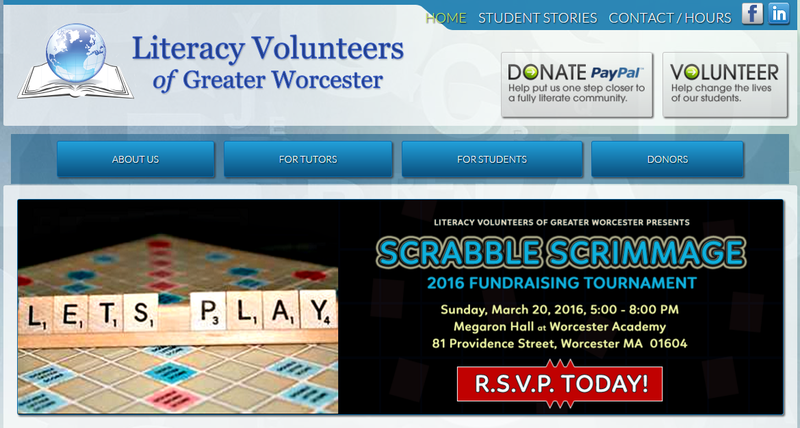 WORCESTER — Teams of Scrabble fans will once again match wits and words at Literacy Volunteers of Greater Worcester’s 2016 Scrabble Scrimmage Fundraising Tournament, on from 5 to 8 p.m. March 20 at the Megaron Hall at Worcester Academy, 81 Providence St.
At the Scrabble Scrimmage, teams of up to six people will each be given a Scrabble game board and a bag of 100 tiles, and will work together during three rounds of play to make as many words as possible using all the tiles provided. The team scoring the highest horizontal and vertical combined point totals within the allotted time wins. Teams can better their chances of winning by purchasing additional tiles throughout the tournament. The entry fee for the Scrabble Scrimmage Fundraising Tournament is $30 per person, or $25 per person if registering as part of a team of four or more players. In addition to Team Scrabble, there will be a dinner buffet, cash bar, raffles and prizes. All proceeds of the Scrabble Scrimmage will help support Literacy Volunteers of Greater Worcester. To register for the event, visit www.lvgw.org. For more information, contact Ellen Benz at (508) 754-8056 or ebenz@lvgw.org.